Bob Harder, PhD, and dean of the GFU College of Engineering, told us about the program. Under the leadership of Dean Bob Harder, GFU’s College of Engineering has come a long, long way. We learned all about the outstanding results, growth and development of what is now the largest undergrad major at the university from Bob at our meeting last week. The mission of the program is to “prepare technically competent and broadly educated engineering students for a life of responsible service emerging from a Christian worldview.” The focus is on “hands-on” learning. “We start students early on building, designing, putting a full system together,” he said. Most of you will remember our meeting room at the old dining hall (the one before Canyon Commons) at GFU. Know what it is now? The Engineering Innovation Center. The building was remodeled, and now has what Bob called a “Maker’s Hub” in the center. It includes a computer design lab, machine shop, welding and woodworking shops, a paint booth and a tool room. The college has 450 students now, which is still small in comparison to some schools. Cyber Security is the newest addition to the degree program. 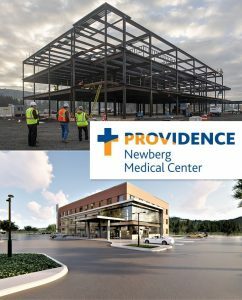 The Engineering School is a also participant in the Chehalem Valley Innovation Accelerator for business start-ups currently housed in CPRD office space. “GFU is known for its transformational curriculum, cultivating an entrepreneurial mindset, and design/build experiences,” Bob concluded. Mike Caruso presented a Paul Harris Fellow pin to Dr. Eric Bergquam. 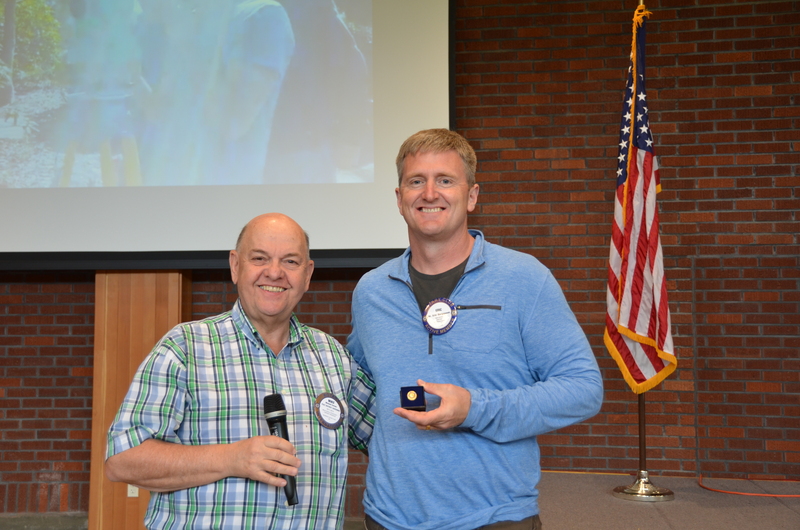 Mike Caruso recognized Dr. Eric Bergquam for being a Paul Harris Fellow “Plus 3,” which means he has donated more than $4000 to the Rotary International Foundation. Congratulations and thank you, Eric! Denise Bacon introduced Jason Holcombe, a GFU grad and realtor who has been in Newberg for 9 years and is interested in learning more about Rotary. 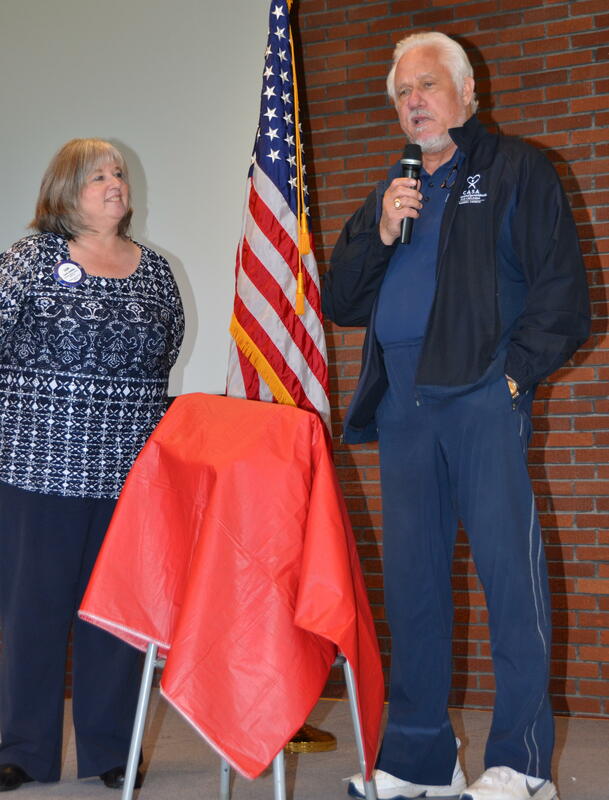 Grant Gerke introduced Shannon Buckmaster, who attended her third meeting in a row. Shannon is the head of Tunes on Tuesday, and works for Mary Kay Cosmetics. Her application for membership in our club has been turned in. Looking forward to officially welcoming Shannon. Om Sukheenai is organizing a committee to help with setup and take down of our annual installation dinner at Methven winery (NOT the new tasting room) on June 22. If you can help, please contact Om. The St. Paul Rodeo needs 20 volunteers to help with traffic mitigation on July 4. Please let Grant Gerke know if you can donate a few hours. It’s always interesting and fun to hear from our international exchange students, and last week’s meeting was no exception. Youth Exchange Program Chair Michelle Bechtold from the morning club introduced all four students, as well as co-chair Elizabeth Still, committee member Kari Fahrenkopf, and Elizabeth Watson, a host mom. 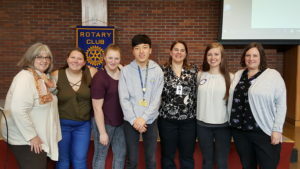 Two local students who will be studying overseas next year are Sara Haas, who will be going to South Korea, and Chloe Bridges, who will spend the school year in Italy. Sara said she is looking forward to “everything,” and Chloe said she is excited to learn a new language. The two international students who are finishing up their school year here–Matilde Harring from Denmark and Jeong Hyeon Choi from South Korea– gave presentations about their countries and their exchange experiences. Matilde shows all the pins she has collected this year. She has traveled extensively with her family, to places like Australia, Kenya and Cambodia, and would like to find a job where she can travel and help people. She will be returning to Denmark July 7 and thanked Rotary for the experience. He shared that school in Korea starts at 8:30am and goes to 10pm. Some even study till midnight, especially if trying for university. He loves U.S. culture, to learn new things and wants to attend Embry-Riddle Aeronautical University in the U.S.
Michele said that next year we will have a student from Turkey and possibly one from Argentina. Well, here’s your first step. 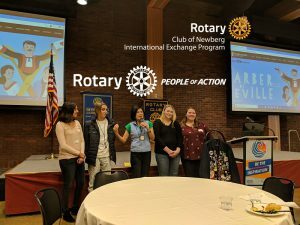 Sign up to be on “NEWBERG NOON ROTARIANS GOT TALENT!”–the entertainment “show” planned for this year’s installation banquet on June 22nd at Methven Vineyards. GUESTS: Shannon Buckmaster attended for the second week in a row and was introduced by Grant Gerke. In addition to leading Tunes on Tuesday, she is on the board of Habitat for Humanity. 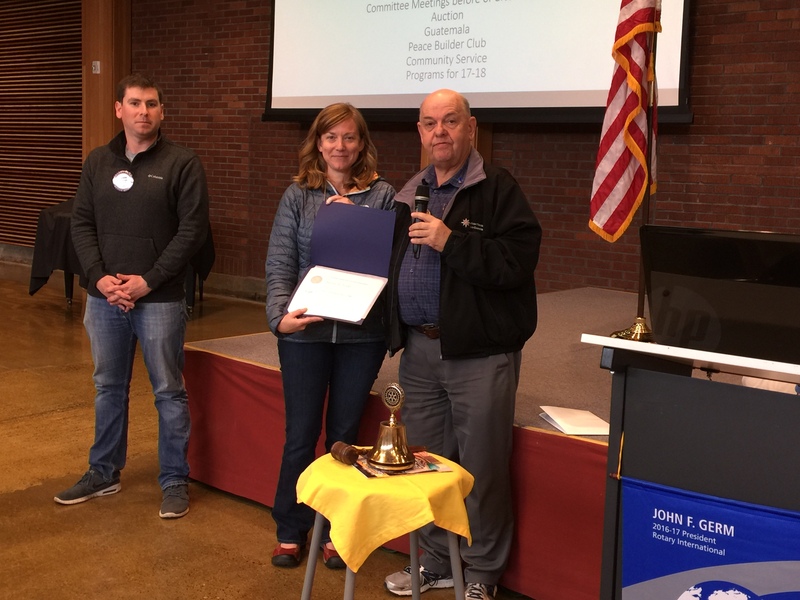 She said she was “ready to commit to Noon Rotary,” and has turned in her application for membership in the club. Andrew Aylor, left, and Mike Caruso, right, present Leona Todd with her Paul Harris certificate. 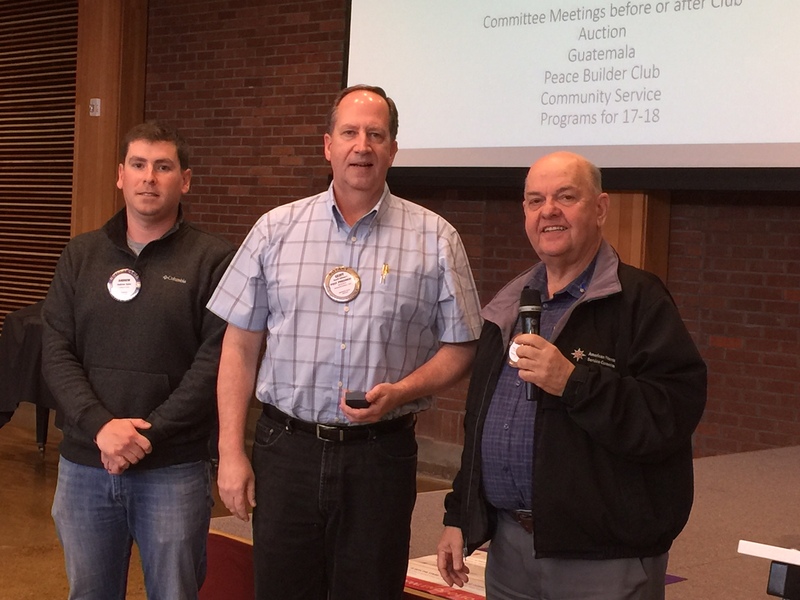 Andrew Aylor and Mike Caruso had two presentations to make regarding our club’s Paul Harris Fellows. Leona Todd was presented with a certificate for being our club’s newest Fellow, and Geoff Gilmore was acknowledged for being a “Plus 2”–meaning he has contributed in excess of $3000! Giant kudos and thanks to Geoff and Leona. BABY NEWS! Dan Keuler announced the results of their “envelope opening” on Mother’s Day to reveal the gender of their upcoming first child –and it’s a boy! And not only that, he has a name already: Jackson. Andrew Aylor also had baby news. He and his wife are expecting their first in September….a girl. Congratulations to both! May 25 Help clean up Memorial Park anytime between 3 and 7pm so it’s ready for the holiday festivities. And free pizza! Please see Jim McMaster. June 22 Installation Dinner at Methven Winery. Sign up now! 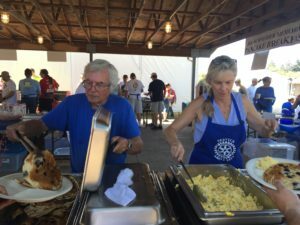 July 29 & 30 Rotary pancake breakfast. Sponsors still needed and tickets to sell–please see Jeff Lane. Also–volunteers needed for set up from 8:30am to noon on Friday, July 28. When asked at our meeting last week if they knew someone who was autistic, more than half of the attendees raised their hand. 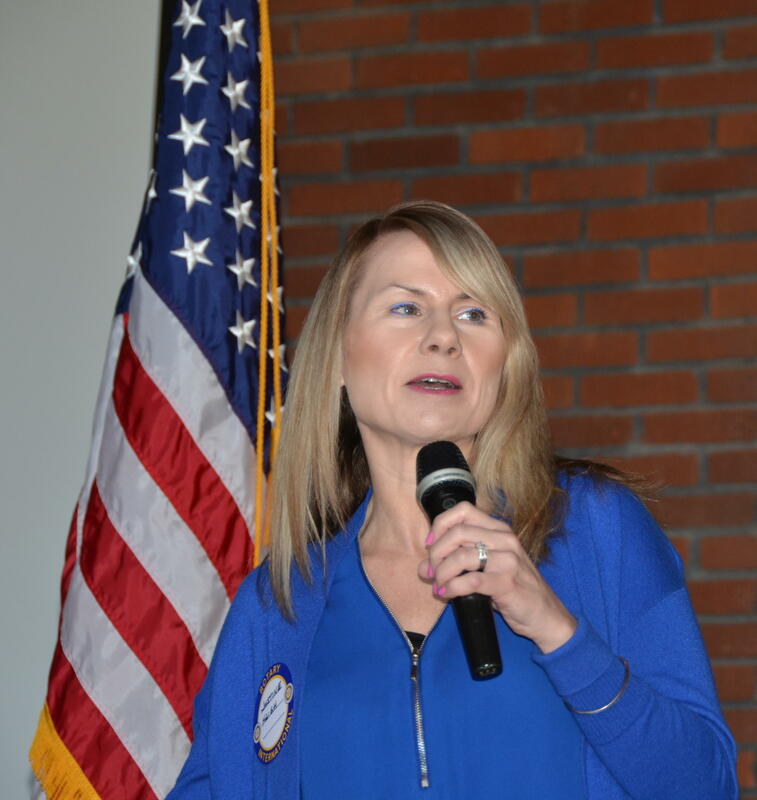 According to our speaker, George Fox University Professor Janine Haigh, one in 66 people in the U.S. has been diagnosed with autism, compared to one in 20,000 in the 1970s. And, Oregon and Washington have one of the highest incidence rates–one in 55–of the 50 states. Janine had an amazing story to tell about her autistic son and Fidgetech, the nonprofit she founded to provide a supportive community for young adults on the autism spectrum. Through Fidgetech, they can learn technologies, uncover interests and talents, develop technical skills and achieve educational, work or personal goals. Her programs through Fidgetech attempt to do just that. The “Explorer” program is an evening program where attendees are encouraged to explore various areas of technology to expand their technical abilities and understanding. They also participate in social and community activities. 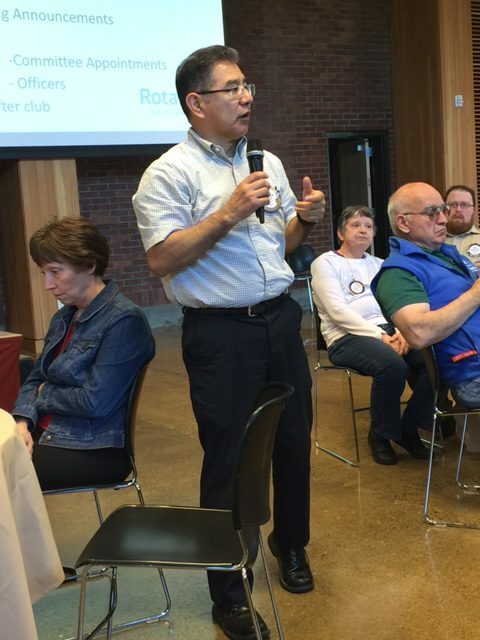 The “Education” program collaborates with local colleges in the Willamette Valley. Participants pursue technical education and are supported by mentors. 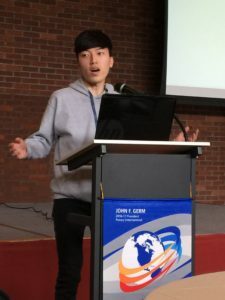 To help raise awareness, a “Game Jam” was recently held and Fidgetech is now part of the volunteer program for Intel employees. For more information, visit the fidgetech.org website or contact Justine at justine.haigh@fidgetech.org. TA DA! 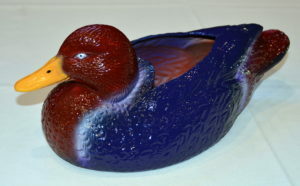 The newly painted Duck was unveiled by John Kerekanich, who deserves a big “thank you” for its spiffy new look. As a result of this year’s auction, this beloved little funds collector was painted in the colors of Linfield College to honor the late Ray Simonson. It’s just calling for more $$$$ now, don’t you think? Rebbeca Wallis from the Newberg-Dundee Police Foundation Board was Denise Bacon‘s guest. Al Herriges introduced two representatives from the St. Paul Rodeo: Cindy Schonholtz and Kevin Smith. Kevin reported that the Rodeo starts June 30 this year and offers 6 performances in 5 days. 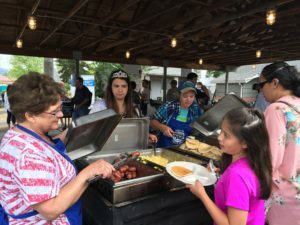 He also invited us to participate in a June 4 trail ride, which starts at 10am, as well as a fresh strawberry Pancake Breakfast that day from 7 to 10 am. Yum. Grant Gerke introduced Shannon Buckmaster with Mary Kay Cosmetics. 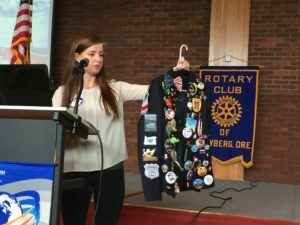 Shannon is interested in joining Rotary. She is a GFU grad who has earned 5 vehicles with Mary Kay, including a pink one! She is also the director of Tunes on Tuesday and a volunteer with A Family Place. Grant also asked for volunteers who might be interested in working a booth at the Rotary International Convention in Atlanta in June. Air fare and hotel provided. Please contact Grant for more info. Tanner Schneider was also a guest for the second week in a row! 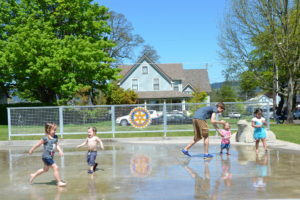 Come help spruce up Memorial Park on May 25 in time for the Veterans’ events for Memorial Day. Please see Jim McMaster, who has promised pizza for volunteers. Rubies and Roses, the annual fundraiser for Chehalem Youth and Family Services, will be June 3 at the Cultural Center. Dinner to be catered by the Joel Palmer House and dancing to Hit Machine. Please see Deborah Cathers-Seymour for more info. Special meeting topic on June 21 when Bishnu Subedi joins us from Nepal to update us on our water project there. Please come show him a warm welcome. Don’t forget the Installation Banquet scheduled for June 22. Come thank Leah for her service as President and welcome Todd as our new President. Last week’s Club Assembly meeting coincided with what seemed to be the first warm, sunny day in about 9 months. Maybe Ray Hillman brought the sun back with him, as he just returned to our club after wintering in Mexico. Welcome back, Ray! 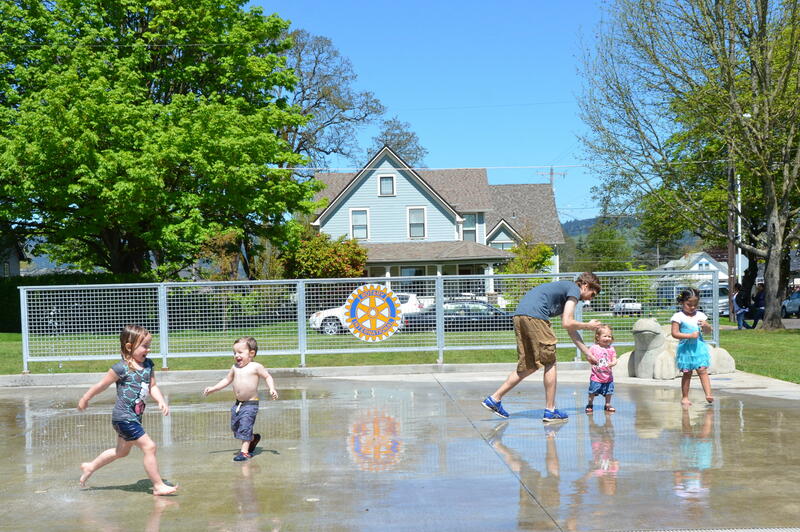 Auggie snapped this great photo of families enjoying Rotary Centennial Park right outside our meeting room. Officers for next year. 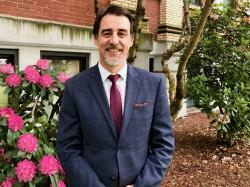 President Leah commended Om Sukheenai for stepping up to take the President Elect position, with Scott Karn‘s recent announcement about taking a new job in Portland. So now the club is in need of a candidate for vice president. Please think it over, and if you are interested, talk with Leah. Community service projects. Leah asked club members to think about our existing projects to see if any changes are warranted. It’s rare to get a snap of Auggie…he’s usually behind the camera! For example, do we need to designate a separate community service group? There was also a suggestion to prepare a list of the projects we do along with the primary contact person for each to give to new members. Committees. Time to review your committee commitments and see if there are other areas you’d like to participate in. Geoff Gilmore reported that a summer intern has been hired to do some marketing. Our intern is the vice-president of student affairs at George Fox University and a marketing major. He will be a senior in September and will start working the first week in June. 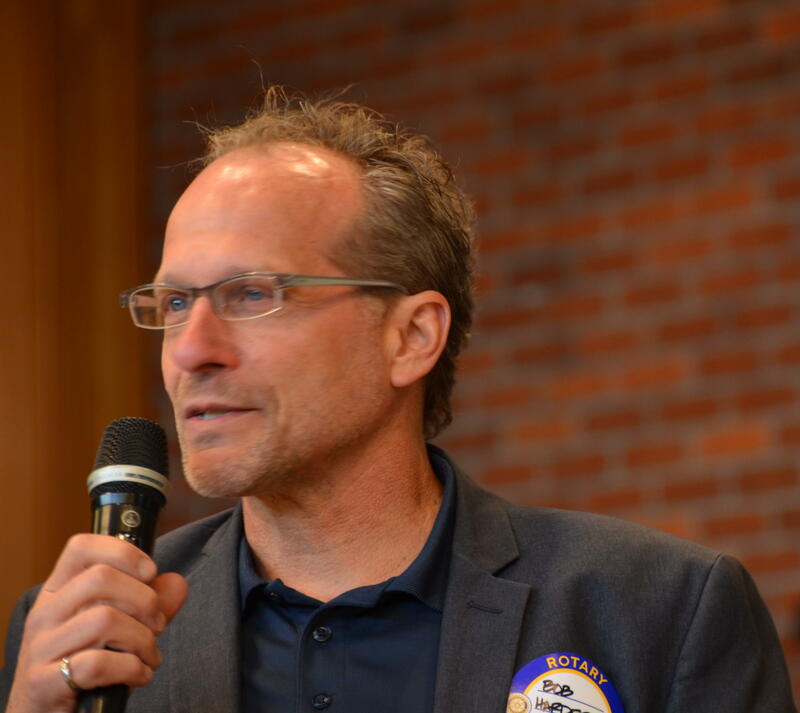 Geoff said he will focus on two things: building the Rotary brand in the community and increasing membership. Geoff also floated the idea of having a mural of Rotary activities painted somewhere in town. He is interested in your ideas for that. The group also discussed the possibility of finding a way to help address the very serious problem of increasing teen suicides in Newberg. Please talk to Denise Bacon if you have an interest in helping with this matter. GUESTS: Tanner Schneider had heard we were a greet group and walked in by himself to check us out!